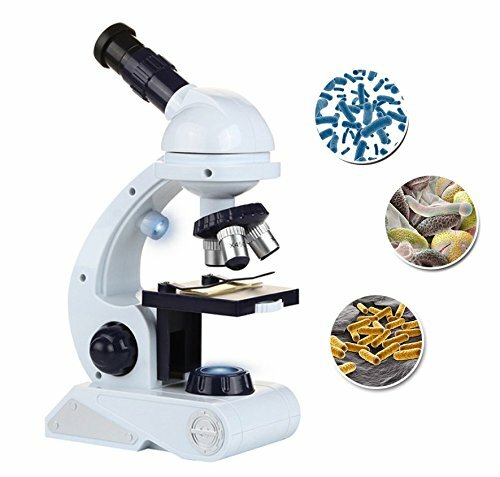 >Lightweight and portable, the Kidcia children's microscope is ideal for pre-school science. The Microscope offers a powerful 80x to 450x magnification range, making it easy to examine blood samples, bugs, and anything else that's worthy of a closer look. The microscope also includes a built-in LED light that provides a bright, clear image, along with a rubberized eyepiece for comfortable viewing. 4.Include 1 microscope,9 prepared microscope slides(8 blank and 1 with specimen),2 collecting bottles,1 tweezer,1 scalpel,1 spatula,1 needle and 1 plastic container. The packaging box measures 10.4"x7.7"x5.1" and weighs 550 grams.